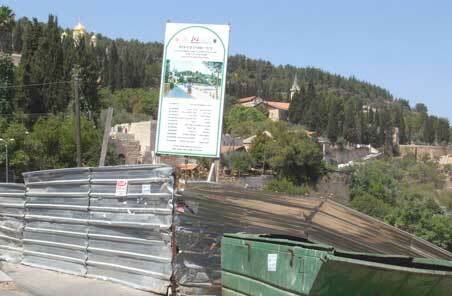 STOP BUILDING IN EIN KEREM WADI! A building project with devastating consequences is going on in the heart of Ein Kerem, only meters away from its historic spring, which has been in use since the days of the Bible. 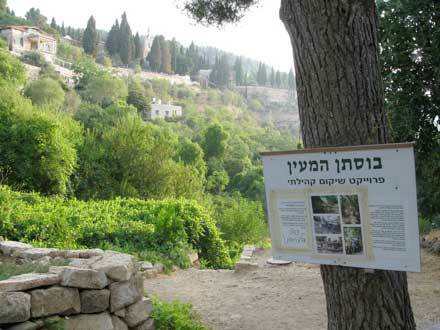 The Ein Kerem basin is the last remnant of traditional agricultural landscape in the environs of Jerusalem. There are ancient terraces, orchards with grape vines, figs, almonds, pomegranates and carob and of course olive groves, as well as fragments of natural forest, a moving reminder of how this country looked in Biblical times. 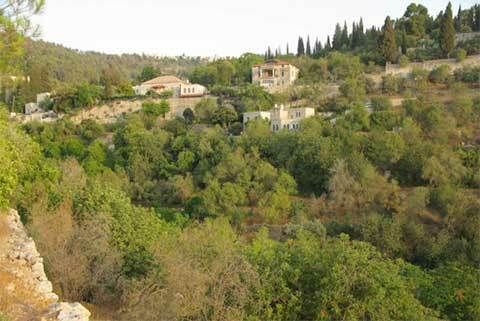 Ein Kerem also has the richest selection of traditional rural stone built – vernacular architecture – in the country. It’s a style of building that was common here for thousands of years, until the revolution of the modern era, and has almost entirely disappeared from our landscape. 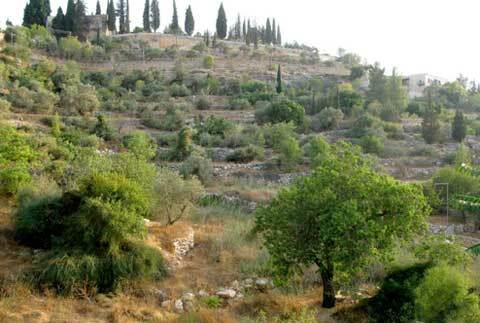 It’s miraculous that Ein Kerem and its beautiful surroundings were saved, despite their proximity to the big city of Jerusalem. 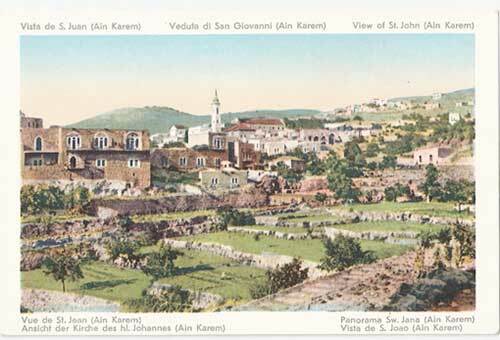 [For details on the rich history of Ein Kerem, its various building styles, and on the miracle of its preservation in our times, see a separate note. From the days of the Bible, the water in this spring has been used to irrigate the terraces, orchards and gardens in the wadi, or valley, beneath. Hundreds of thousands of visitors and pilgrims come each year, to see Mary’s Spring, which is located under a mosque structure in the centre of the village. In days gone by, the pilgrims would fill small containers with water, and take them back to their homes across Europe. At the Jewish holiday of Passover, the water is used to make special matza called Matza Shmura. This place has been holy to Christianity from its first days, as evidenced by an account by Theodosius, dating back to 530 AD. The road leading to Mary’s well is part of the pilgrim route which connects the Church of John Ba-Harim, the birthplace of John the Baptist, with the Church of the Visitation, named for Mary’s visit to her cousin Elizabeth. The meeting between these two pregnant women, one carrying Jesus and the other John the Baptist, which took place at this spring, is the inspiration for the Magnificat prayer. 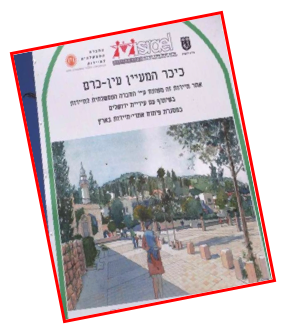 It is here, in this sensitive place, that the Government Tourist Office and the Jerusalem municipality have initiated a bizarre building project which threatens the whole area. In contrast to other holy Christian sites, where tragic events took place, the events sanctified in Ein Kerem were happy ones, occurring in a pastoral atmosphere. Pilgrims who walk the paths of Ein Kerem today can experience the traditional agricultural landscape, much as it was in this Jewish village in the time of Jesus. 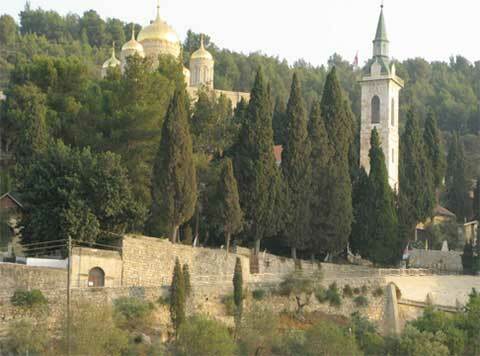 The route leading from the Church of St John Ba-Harim to the Church of the Visitation, including the entire road in front of the spring, was the property of the Catholic Church up until 1948. The landscape that can be seen on this route is amongst the most beautiful in all of Israel. Exploratory excavations, carried out recently, exposed ancient water ways that carried water from the spring to the cultivated terraces on the slopes of the wadi below. 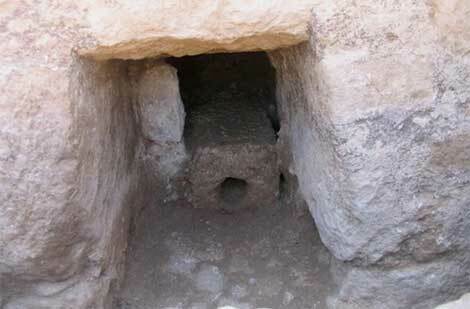 We currently have a temporary summary of the findings by the Israeli Antiquities Authority, which carried out the excavations, pending the release of its final report. It’s important to stress that this was only a partial excavation and that it is reasonable to assume that a larger dig would have uncovered findings of much greater worth. The original fountainhead from the Roman-Byzantine period was found, 5 meters below the present one, located where we know it in Mary’s spring, beneath the mosque. At that time, they had placed a rectangular stone in the opening of the fountainhead, carved in the shape of a pipe, measured in roman cubits – 88cm deep and 44 cm wide. A hole 15 cm in diameter was carved through the centre of the stone. The water flowed from the fountainhead via this stone pipe into a small sinking pool, about 60 cm x 150 cm. From the sinking pool the water flowed through stone pipes into irrigation tunnels and into the wadi. A water system from a later period was also found, which carried the spring water from its present source, located under the mosque structure, via a tunnel under the present street. This tunnel was covered with large stones which were also carved, and led to a large pool that was last in use at the end of the Mameluke era i.e. the early 1400’s. 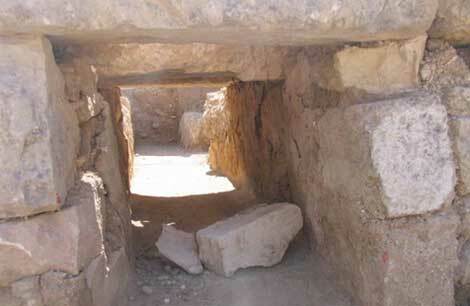 These findings, which were uncovered during the exploratory dig, were preserved and covered again with sand, so that the destructive present day building project could continue. 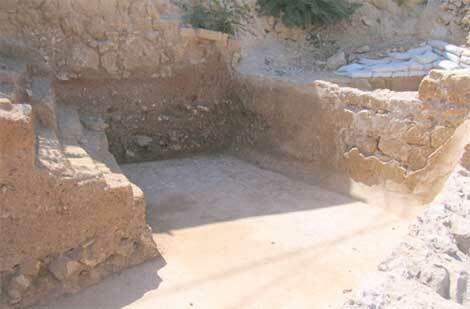 Whether the older water system is from the 2nd Temple period, i.e. from the days of Jesus and John the Baptist, or whether it turns out that it is a little later, either way these important discoveries should obviously have been incorporated into the new project involving Mary’s Spring. 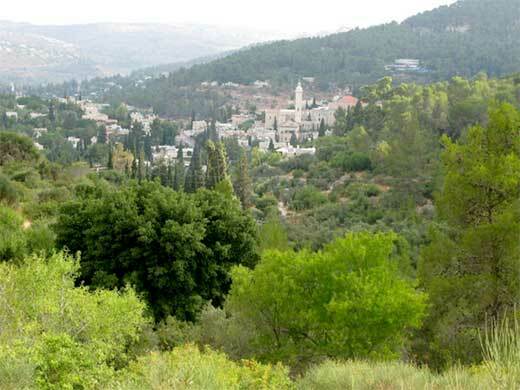 Ein Kerem residents have launched their own community rehabilitation project, cleaning out the wadi, repairing the stone terraces, planting fruit trees and resurrecting a corner of paradise which attracts enthusiastic visitors from all over Israel and abroad. Rehabilitating the ancient water ways and directing the spring water down into the wadi has environmental, cultural, religious and tourist value of the first order. 4. And what is being built in the most sensitive spot in Ein Kerem? A store room for the municipality. As though it has nowhere else to store brooms and boxes! The municipality is constructing a concrete building, 30 m long, and 12 metres wide, which cuts across the wadi at the foot of the spring. It is 4.5m high inside. Officially it’s a store room. Urban plan [TABA] 5168 which authorized this project permits the construction of 100 sq m for storage and 50 sq m for public toilets. The Authorizing Committee insisted that no commercial use should be made of this structure. 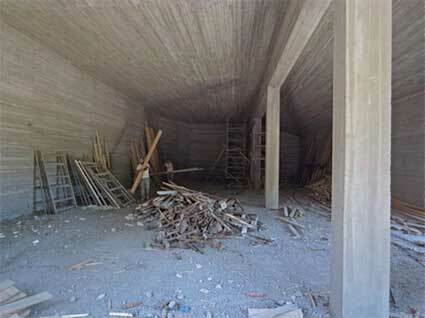 The size of the present structure is more than 300 square metres ie more than 3 times the permitted size. And (fortunately) no toilets [which arguably would be a public service] are being built. Just to remind you – access by vehicle to this area is usually difficult and often impossible. The street in front of the spring is narrow and leads to a dead end. It is frequently blocked by vehicles and large groups of pilgrims on foot. In order to reach the Municipality’s new storage room it would be necessary to construct a second road, going down the steep slope into the wadi itself. 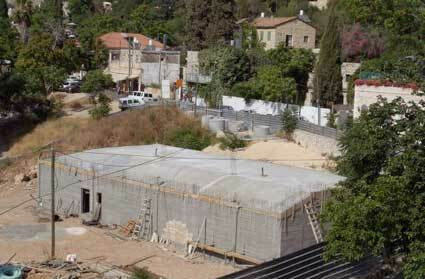 There is a fear in Ein Kerem that the building which is being erected is destined for another purpose, and will be used as a function centre or a large restaurant. This would be very lucrative for all involved (including the municipality), but is expressly forbidden by TABA 5168. 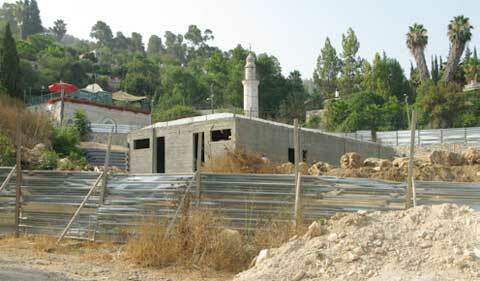 This structure violates a central planning principle in Jerusalem – valleys must remain free of any buildings. A huge concourse, or The Platter, as it is already being called. According to the architectural drawing on display on a sign at the site, the concourse is meant to extend from Mary’s spring and the street all the way to the roof of the new Municipal storage room, erected in the wadi. It’s designed to be a lookout, but it will totally sever the connection between Mary’s spring and the wadi, and will push the view away from the visitor, blinding him instead with the strong Jerusalem light. A few trees in pots set at intervals on a concrete floor, as they appear in the picture on the sign, won’t be able to remedy the situation. Or perhaps the picture on the sign, obscures a different intention. Perhaps this huge concourse is not intended to function as a lookout at all, but to provide a large area for the erection of stalls selling everything from fake jewelry to falafel, a place for additional tables for the nearby restaurants, and of course for cars to be parked. The concept of a ‘lookout’ has been transformed into a wide square, suitable to a big city [perhaps] but definitely not to a small intimate village, the beauty of which lies in its proportions, its pastoral nature, and in the variety of breathtaking lookouts it provides for those who walk along its paths. The planned Platter overruns the top of the wadi, with its special gentle agricultural topography in a brutal fashion; burrying the exciting archaeological findings beneath it. 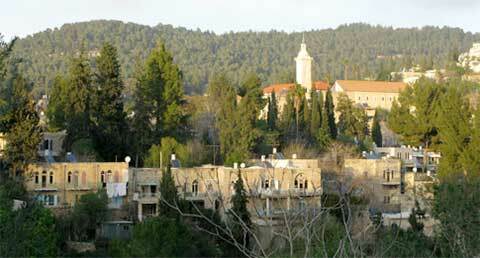 Another aspect which has been ignored is that the uniqueness of Ein Kerem lies in the intimacy of the experience it provides. For millions of visitors and pilgrims, visiting Ein Kerem is primarily a spiritual event, a religious experience, a one-ness with nature and memories of lives long past. The commercial uses which underlie the present development of this huge Municipal store room are being hidden from the eyes of the public and blatantly contradict the nature of the area. The project described on the sign at the site is a barbaric knife stuck into the heart of one of the most beautiful and spiritual places in Israel. We are calling for an immediate halt to the building project near the Ein Kerem Spring. This time can be used to prepare a new alternative concept to this destructive plan which was forced on us, it now appears, with some deception. Here is one suggestion for the rehabilitation of the Ein Kerem spring and wadi, which will retain the intimate proportions of Ein Kerem and preserve its beauty. Lower the street in front of Mary’s spring so that its level with the spring, in order to reveal the ancient stone paving that is most likely beneath the asphalt. In order to keep the historic size of the street, access for vehicles will need to be limited to emergency vehicles, service vehicles and residents. Parking in this street should be prohibited. Pull down the Municipal storage room. Continue the archaeological excavations on this level, where the Storage building was being constructed, beneath the street and above the wadi. Create a pathway for pedestrians and pilgrims which will enable them to see the exciting findings once they are excavated and preserved. Let the water from Mary’s Spring irrigate the orchard at the top of the wadi, which will continue its centuries old work preserving the wadi and will also rehabilitate the area which has been badly damaged by the present Municipal storage building project.